Referral and Co-Counsel Arrangements with Steven Titus & Associates, P.C. Steven Titus & Associates, P.C., is happy to join the fight when you need an experienced Campbell County criminal defense or personal injury attorney. Growing up with parents who worked around the clock at their bail bond business, Steven saw many people pass through the hands of the justice system, and this experience motivated him to defend those accused of a crime. He has expanded his practice to representing victims of personal injury as well. If you face a catastrophic injury or criminal case in Wyoming and need help, we offer competitive co-counsel and fee-sharing arrangements. Pursuant to Rule 1.5 (e)(f) of the Wyoming Rules of Professional Conduct for Attorneys at Law, our firm divides fees in proportion to the services performed by each lawyer, with written agreement of the client. We do not share fees if all you do is refer the client/case to us. In regards to contingent fees, we abide by Rule 5 (d) of the Wyoming State Bar: Each attorney or law firm sharing in a fee is legally liable to the claimant for professional malpractice as if they were full partners, and each sharing attorney must be available to consult with the claimant on the matter. Fees are not allowed on a referral basis only. You will work with Steven Titus from start to finish, not an assistant or paralegal. Your matter will get our full attention. We limit how many cases we accept to ensure total preparation, so that nothing is missed as the case develops. You will get our legal knowledge and experience. We understand court dynamics - including prosecutors and judges in Wyoming. You can reach us 24 hours a day, 7 days a week. 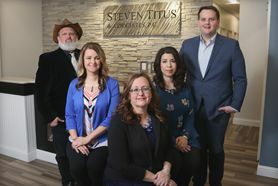 To find out how Steven and his team can help with your unique case, call (307) 257-7800. We look forward to working with you. ∗ Fee sharing is only available between lawyers or law firms, pursuant to Rule 5.4 of the amended Wyoming Rules of Professional Conduct for Attorneys at Law.